Opening with an air raid (or four minute warning!) siren, this first track "Asphyxia" establishes the musical stance of the entire album - a hard, bludgeoning medium-slow track, hard as nails, as catchy as hell - the kind of hookiness you could hang beef carcass from. This track stands between GODFLESH's icepick Rock hybrid sound and, say, NINE INCH NAILS' more commercial structuring. It's the longest track here - over 10 minutes of it - and doesn't seem a moment too long. Non-beat Industrial sound-swirl breaks midway to offer something else again, without spoiling the tempo or tense atmosphere in any way. "Mind-Field (Mix)", every bit as hard, slightly more upbeat, closer to TEST DEPT at their more constructed, this track is less than a minute short of the previous piece. A sampled robot-like voice says something about ordering you to surrender, adding a cold, threatening atmosphere to the white, almost metal-shiny drums which form a wall-like framework under which the faithful bassline cruises in perfect sync while guitar, electronic & noise grizzle over the top. The track collapses into sonic mayhem at about the halfway point, a mélange of swirling noise, but soon finds it's tracks again, thumping along to a conclusion. "Factory" opens a little less harshly, a four-note sequence leading rhythm through the swirl of vocal detritus. The vocalist leads the slowish structure in with a voice as cold as a scalpel's edge. It reminds me a little of BOURBONESE QUALK at their most muscular & gimlet-eyed. "Torment" opens on a sustained synth sound over which the drums leap in a merry dance, changing tempo & structure again and again - it'd be good to see how people cope with this on the dance floor. From fast to medium to slow to... almost too many changes & metamorphoses to cope with. Having said which, it shows SONIC VIOLENCE as having an adventurous approach to structuring - how easy it is to stick to one tempo! "J.F.R.O." floats in like ghostly echoes from cruel times. The waves of sound speed up into a whirling vortex of sound which is kicked aside as the rhythm bursts through. It is a strict, immense structure, as complex as some chrome-and-glass modern shopping complex, and every bit as human. The sound within it, lining the walls with audio gems are almost impossible to focus on - there's so much going on here. Again I cannot think of anyone I can easily compare them to - perhaps THE YOUNG GODS? Maybe, maybe not. This is an immense track & worth the price just to hear it. "Drill" moves onto more familiar territory - there are Rock influences here, albeit none I can too easily put my finger on. There's a grizzling sound, fuzzy sawtooth noise from which I imagine to title is taken. The sound ebbs into a sort of vocal-and-distant-march sound, then reforms into the main track. "Malice" echoes in on the spoken title, the voice distorted by pitch change and feedback. The track itself follows, building into a surfing, surging wall of medium-paced dance music, full to bursting with colour & interesting samples. It transmutes & transforms into a myriad associated structures, managing as always to keep the structure well under control. "Catalepsy (Remix)" concludes the album & is the shortest piece here. It washes in on a miasma of electronic noises, warping & distorting reality over the rhythmic centre which has elements of KILLING JOKE, although pushed way, way back in the sound. It's a medium-paced piece, full of interesting colours & almost visual sounds - subtle flanges which seem to slice through the air; samples which peer from within like 3D masks. As you may have gathered, I try to make these reviews as descriptive as possible & compare the reviewees to whomever comes to mind. 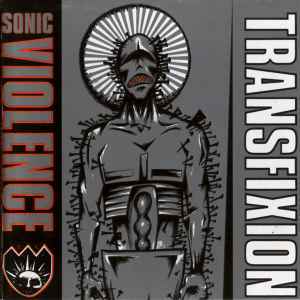 While SONIC VIOLENCE dwell in a field populated by many, I feel they stand alongside few. I think the BOURBONESE QUALK reference stands, but only in 'feel' - the music here is a lot harder, a lot Rockier without becoming Rock! No matter what, it's a fascinating album which keeps you playing it again & again. It can be physical - ie. you could dance to it, and it's cerebral - ie. you always find something new to hear in it. As hard as NAILS. Recommended.